#10 - A mother writes of her 8-year old son growing up in Manhattan as he begins to find his way around the city by himself. 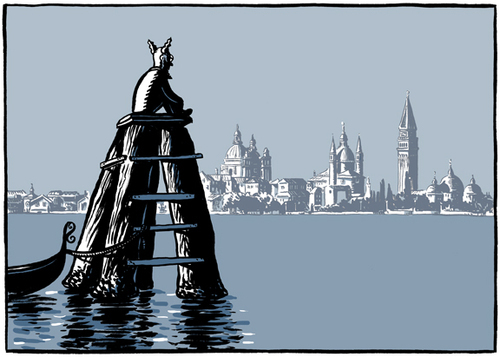 For Richard Weigand at The New York Times City section. Richard suggested a “Where’s Waldo?” treatment. 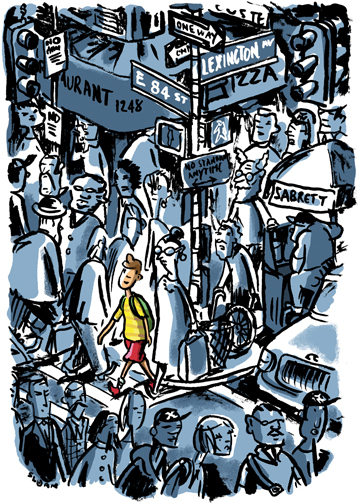 I loved drawing the various NYC characters in this scene. 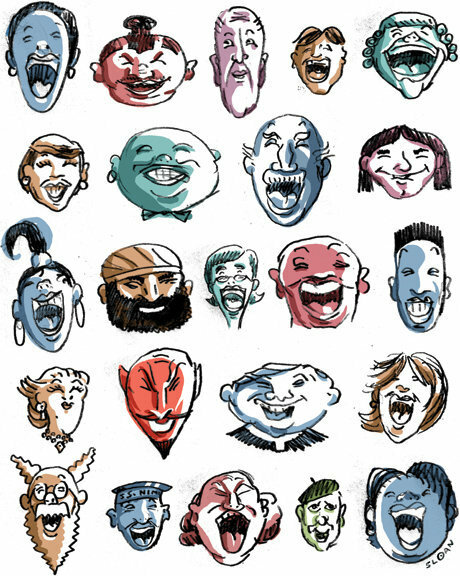 #9 - Article on Laughter, for art directors Matt Petty and Nanette Bisher at The San Francisco Chronicle. This printed large and looked great on the broadsheet cover of the section. I used my pencil sketches of the faces in the final art (the first time I've ever done this) because I realized they lost their "soul" when I tried to re-do them in ink. #8 - Investment Strategies: Is Buy And Hold Dead? Full-page for art director Nai Lee Lum at Fortune magazine. On a quick deadline I only submitted one inked sketch which was approved as-is, and I used this sketch as final art with the addition of the blue background. A happy accident: I ran out of my usual ink and resorted to another less-opaque brand of India ink instead. 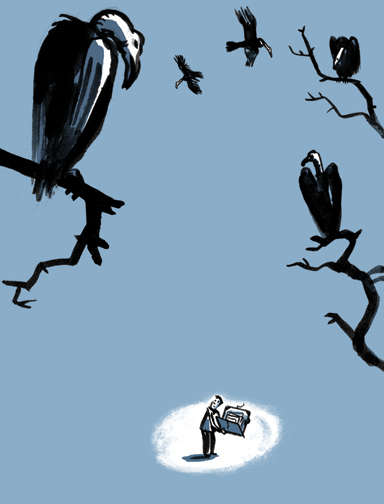 I like how the transparency of the ink shows the brushwork, particularly in the vulture at upper left. 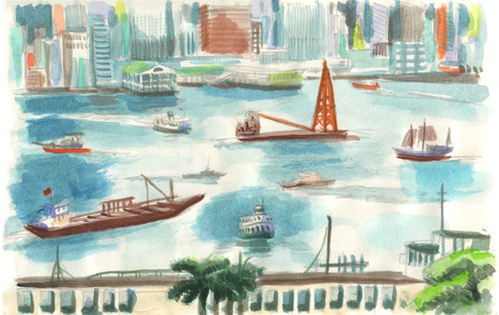 #7 - Watercolor sketches from my family trip to Hong Kong. With our three young children in tow and my wife at business meetings, I was concerned that I wouldn’t be able to sketch at all. I readjusted my way of working (much faster, taking interruptions in stride) and created a series of paintings and drawings that are among the best “en plein air” work I’ve ever done. These sketches are great souvenirs of a great trip, and you can see more of them here. They also inspired my latest graphic novel, “The Redemption of Professor Nimbus”, which takes place in Hong Kong. 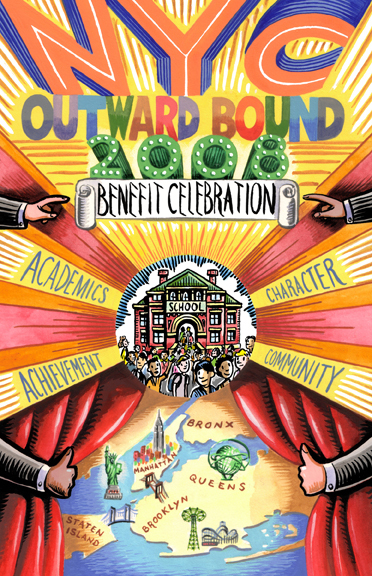 #6 - NYC Outward Bound 2008 Benefit Invitation. In the 12 years that I’ve been creating the cover for these invitations, I’ve never integrated text and illustration as well as I was able to do here. This illustration was accepted into the institutional category of The Society of Illustrators 51st Annual. #5 - The Travels of Nimbus. A series of limited edition prints that I’m using as self-promotion. I wasn’t getting good full-color prints from my printer, so as an experiment I made a print using only black and blue. Since I began mailing these prints to clients, I’m receiving requests to work in black and blue (which I find very satisfying). Four images from this series have been accepted into the sequential category of The Society of Illustrators 51st Annual. 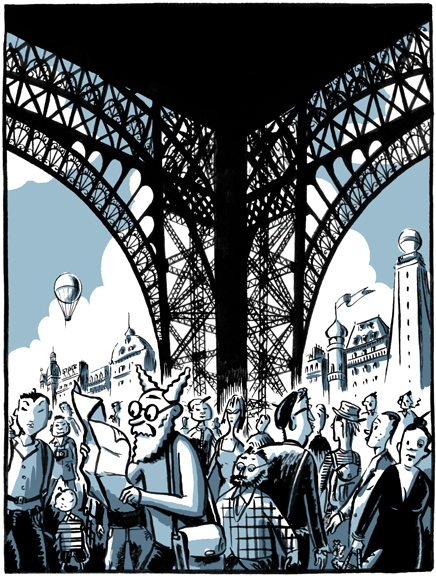 The Eiffel Tower image above was chosen for the American Illustration 27 website. 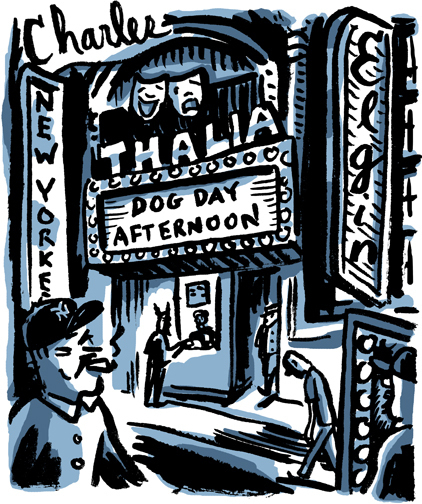 #4 - Movie Houses of NYC in the 1970’s, for Jesus Diaz at The Village Voice. This was one of five black and white illustrations used for five articles about bygone eras in NYC. In each case my sketches were published as-is. I’ve been trying to work this way more often since my sketches usually have a freshness and soul that is lost when I re-do them as “final art”. I’ve added color and am using this image as a limited edition print. #3. Clockwise from upper left: Are Obama and Clinton Tearing the Democratic Party Apart? ; The End of the Clinton Campaign; NASA's Attempts To Stay On Budget; General Petraeus Testifies Before Congress. #3 - The New York Times Op-Ed Letters, for art directors Brian Rea and Leanne Shapton. These assignments are always a thrill because of the high adrenaline deadline involved (same-day), the conceptual freedom they afford, and because they’re in black and white. 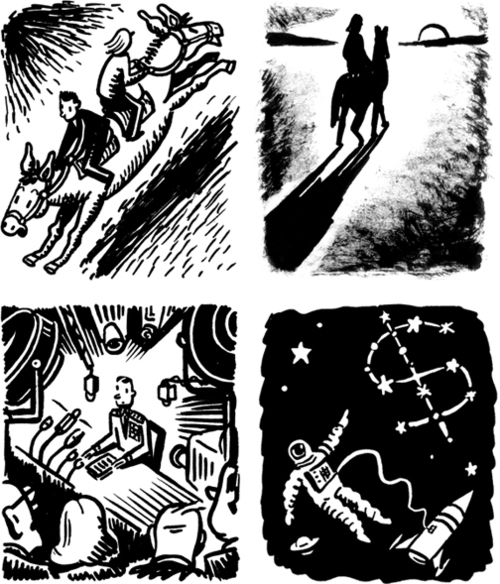 Two years ago, former NYT Op-Ed assistant art director Sam Weber first suggested that I use my inked sketches as final art (as is the case in these four images). His suggestion revolutionized the way that I work. The image of Obama and Clinton on the donkey was chosen for the American Illustration 27 website. 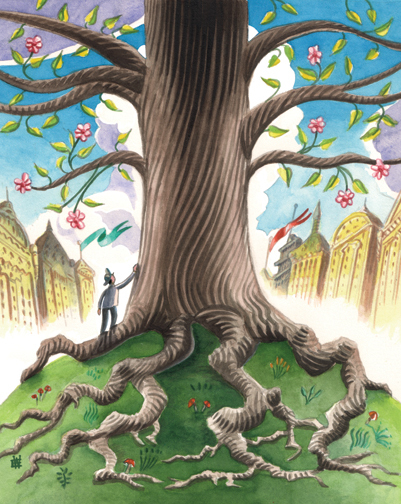 #2 - Investing in Retirement Funds with Strong Roots, for SooJin Buzelli at Plansponsor. This was the first time a client had specifically asked me to work in my Ewan MacLeish style. This watercolor looks and feels like it belongs to the narrative that characterizes the work in my Ewan MacLeish portfolio, which you can view here. #1 - The Redemption of Nimbus, my third graphic novel. This book is about catastrophic global warming, takes place in Hong Kong, and is inspired by the sketches that I painted there during a family trip in July 2008. 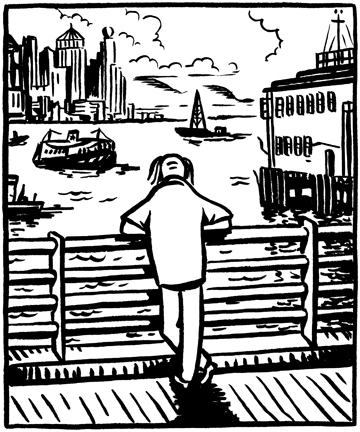 I’ve inked over half of the panels, and if all goes well I will publish it this coming summer 2009. Working on this book is incredibly satisfying. I work on it whenever I can, in between assignments, and often late at night. I wish all the best for the holidays to all of you!